Since Tuesday’s post I have been pondering the centrality of the crucifix in Christian faith. We cannot experience eternal life until we experience earthly death, and we cannot experience resurrection faith here in this world until we have experienced at least a taste of the path through suffering. Note that Abram, (who in the next verse is given a new mission and a new name – Abraham), had to get down low – not standing before God – the posture of ready-ness, or kneeling – to earnestly and actively pray, or sitting – to reflectively listen, but Abram prostrates himself, falls to his face on the ground – the posture of total submission and desperate need. And when Abram is finally brought low enough he is able to hear the voice of God speaking to him. Good liturgy and prayer involves all postures of both the heart and the body. Every emotion of the heart has a place in the Liturgy of the Church. The psalms express joy and anger, hope and despair, frustration and passion. We bring our own personal emotions to the liturgy too, every human emotion has a home and an appropriate expression in our prayer and in the liturgy. Every posture of the body also has a place in our worship. A few years ago I was asked to celebrate an early morning Mass for a conference group. When I arrived some were seated in chairs and most were reclined on large floor cushions. The group remained in position throughout the Mass. I am sure that they were participating internally in the Mass, but there was no sign of this in their bodies. The experience helped me to appreciate physical activity in prayer, both personal prayer and communal liturgy. In his masterwork The Spirit of the Liturgy Joseph Ratzinger (later Pope Benedict) reflected on Jesus’ postures in prayer. “[On the Mount of Olives] According to St. Matthew (22:39) and St. Mark (14:35), Jesus throws himself to the ground [prostration]; indeed, he falls to the earth (according to Matthew). However, St. Luke, who is in his whole work (both the Gospel and the Acts of the Apostles) is in a special way the theologian of kneeling prayer, tells us that Jesus prayed on his knees” (The Spirit of the Liturgy , 186-187). It is a beautiful thing to stand and sit and kneel with others in liturgy. While our voices pray in unison the prayers and responses of the Mass, so too our bodies stand together, and sit together and kneel together. 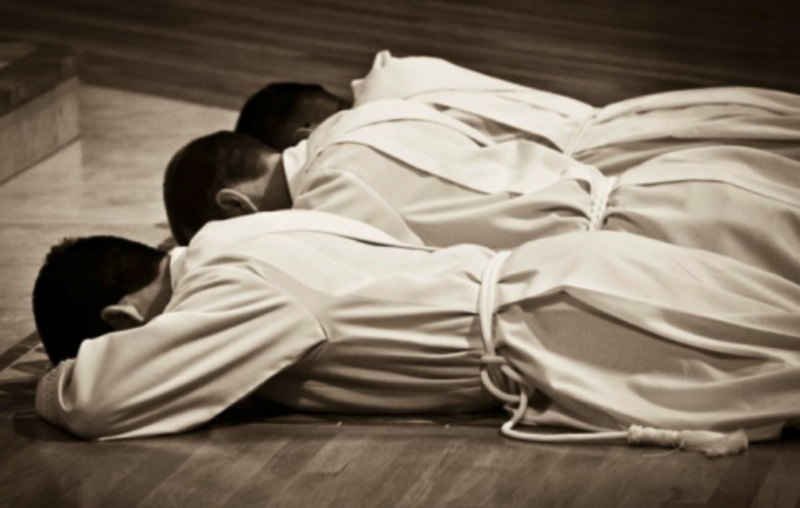 At Ordination the deacon, priest or bishop lies prostrate before the altar as a sign of total gift to God. On Good Friday the afternoon liturgy begins with the priest lying prostrate in silence before the altar. You may find it helpful to allow your body to physically voice your need to Jesus in your prayer. At time you will relax in an armchair to pray. There will be other times when you stand alert and ready in your prayer. Then at times kneeling to pray is a powerful sign of your submission to the presence and action of God. There will be other times when you feel moved to lie prostrate in prayer. 3 Responses to "humble in prayer"
At this time I am struggling with mobility and have a very painful knee which won’t let me kneel. How I miss this in Mass, I feel bereft, like I am not fully participating. It is beautiful to watch different peoples approach to the altar, and the way they genuflect before taking their seat. Our bodies are a gift from God made in His likeness and to be used for His Glory. I look forward to the time when I can kneel once more before my God. Lovely comments Jane. Might I suggest you pray the healing blood of Jesus over your knee each morning. I pray it over my family, house, health, work each day, bless you.